There are wonderful things to see in the Pacific Northwest. This includes big trees, mountains, beautiful scenery, grand man-made structures and fascinating wildlife to mention a few. There are also interesting details that might be hidden in plain site. Here are some things I found hiking the Bowman-Rosario Nature Trail in Deception Pass State Park that might be easy to miss. The trail skirts the cliff side along the north shore of Bowman Bay. Much if it is carved into solid rock. 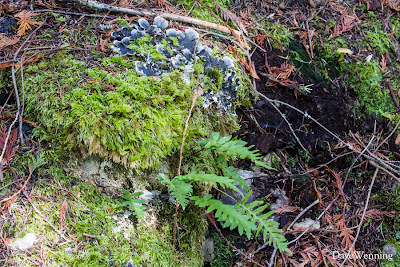 The rock face along the trail may be covered with plants, mosses and lichens. 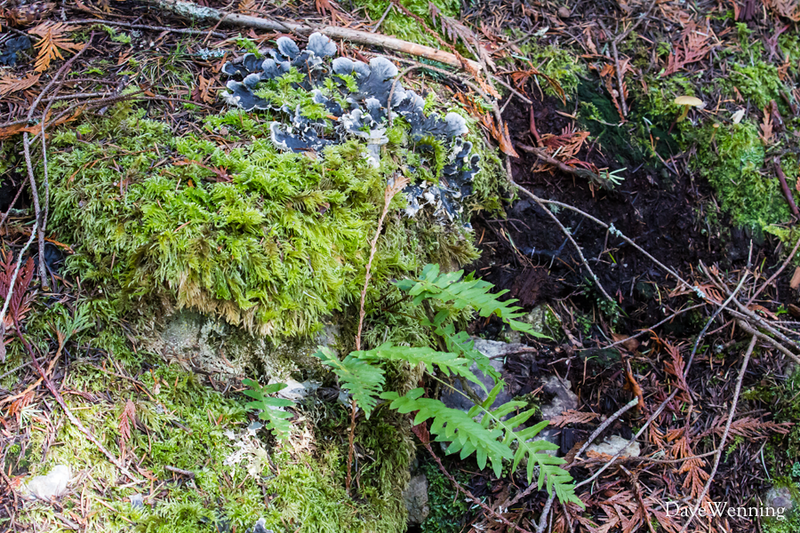 The gray leafy structure in the photo is most likely Peltigera membranacea a variety of Dog Lichen. Lichens are symbionts and fans of Star Trek Deep Space Nine will know what that means. Remember Jadzia Dax? Lichens are fungi that have incorporated algae into their body structures. The algae photosynthesize and provide nutrition to the fungus. 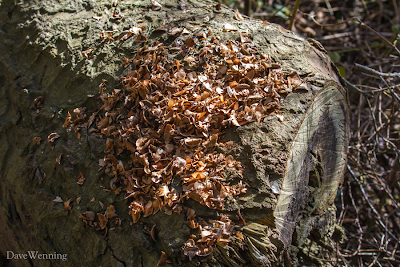 The fungus, in turn, offers the algae protection and a structure in which to grow. Pay attention along the trail and discover that there are actually dozens of lichen species growing on the cliff face, on rocks and in the trees. Some look like colored dust, others make rough patches and still others look like yarn tangles or long strands of hair. The ferns in the photo are Licorice Ferns (Polypodium glycyrrhiza) named because of the flavor of their rhizomes when chewed. They are commonly seen growing with moss on rock faces like this and especially on the trunks of Bigleaf Maples (Acer macrophyllum). The casual hiker admiring the scenery might not notice that there are flowering shrubs growing out of the rock face. 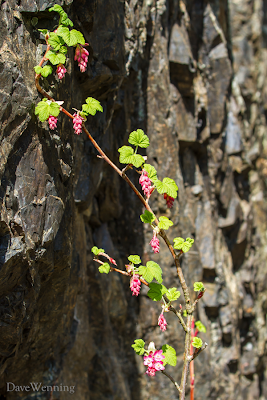 This is Red-flowering Currant (Ribes sanguineum), one of the earliest spring bloomers in the Pacific Northwest. Sedums, Heucheras and Mahonias may also be found growing in this seemingly hostile place. All of these are plants admired and cultivated by gardeners and available at nurseries. In spots, the upland forest canopy opens up to reveal secrets. 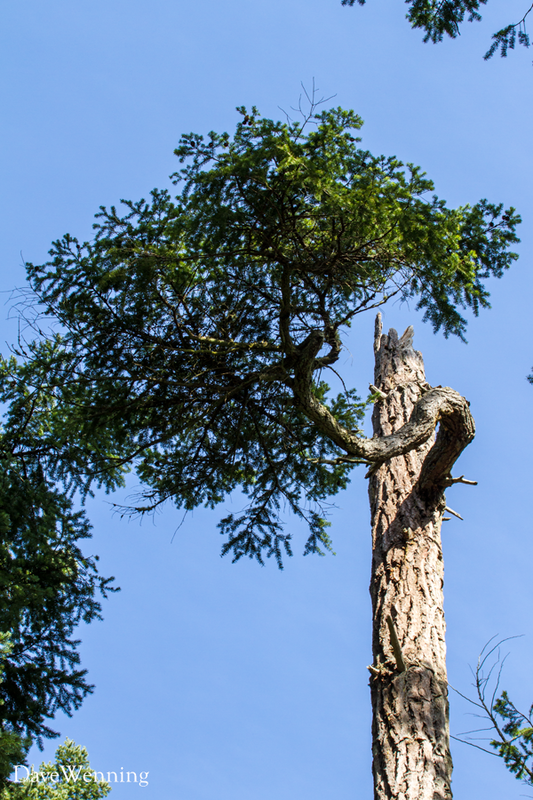 This amazing Douglas Fir (Pseudotsuga menziesii) clings to life despite having lost all of its crown. Only a single branch remains as a hint of its former glory. That branch may still be producing cones and seeds which will pass on those wonderful genes. I learned something amazing from a recent episode of Nature on PBS. This Douglas Fir's companions may be helping it to survive. In "What Plants Talk About," University of British Columbia forester Suzanne Simard reveals that the trees in a Douglas Fir forest are interconnected. To help understand this, recall the Mother Tree in the movie Avatar. In this case, however, it is not science fiction. A vast underground network of fungal mycelia attach to the roots providing an interlinking network. Through this network, carbon produced by photosynthesis in one tree can be passed some distance away to another tree. This may be the major source of carbon for seedlings growing in the shaded understory. It appears the trees in a forest are taking care of their offspring as well as each other. The survival of young trees or those under stress might depend on older, healthy trees in the network. Is it possible that all the plants in a forest are interconnected? I want to learn more about this. It has changed how I perceive the forest in a profound way. Trail's end is at Rosario Beach. Some distance off shore is Northwest Island. I spotted two black spots, and on a hunch, strained the telephoto lens to get this shot. Those spots are a pair of Bald Eagles resting in the isolated seclusion of the island. Another lichen imparts an orange coloration to the solid rock. Urchin Rocks at Rosario appear from shore to be lifeless, but look carefully. 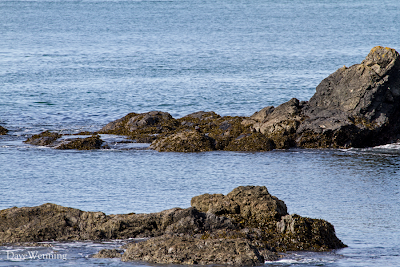 Can you spot the pair of Harlequin Ducks resting and preening in the camouflage of Rock Weed? Click the photo to enlarge it. Hint: The drake and hen are a few feet apart near the center of the photo. I wonder if this is the pair I spotted in the same area a year ago. I have learned to check these rocks carefully to spot hidden wildlife. 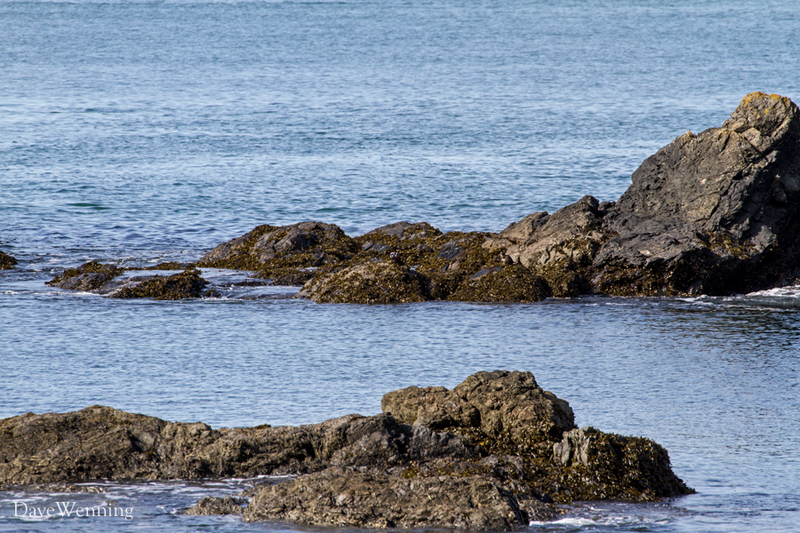 From out in the bay, the high pitched courtship song of Black Oystercatchers revealed another attraction hidden in plain sight. 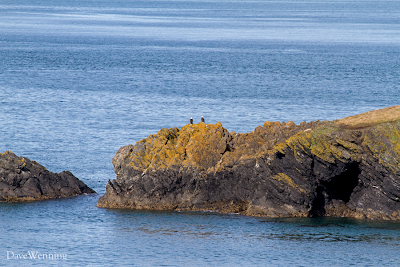 Without the telltale sounds, I might never have noticed this pair performing their nuptial dance on the top of this rock. The gulls seemed to be unaffected by their performance. 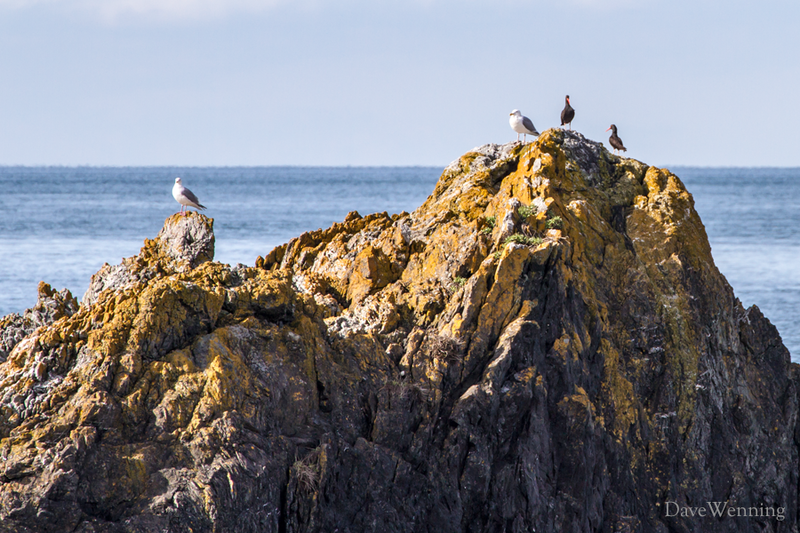 I have seen evidence that gulls and oystercatchers are friendly, congenial neighbors. On the return back to Bowman Bay, I spotted this pile of fir cone scales on a log near the camp sites. 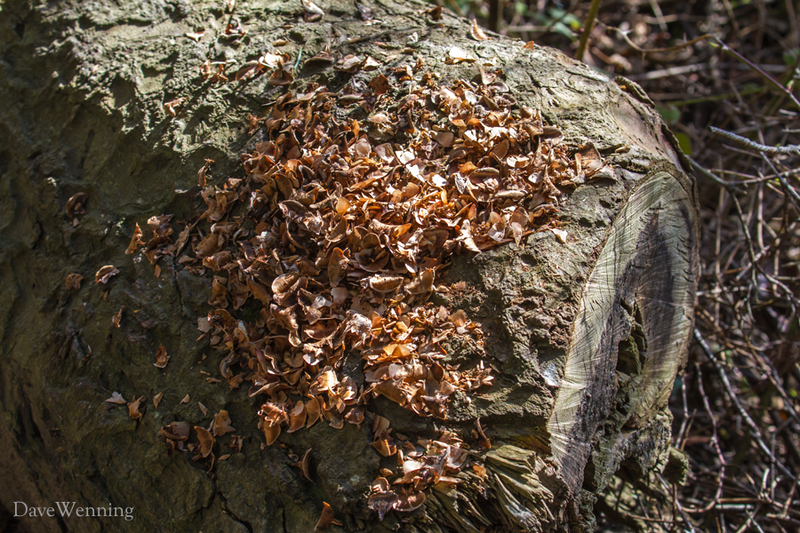 Such middens are signs of wildlife. This is a feeding station of our native Douglas Squirrel. I have found these telltale signs on my treks all over Fidalgo Island. The squirrels will return to the same spot to tear the cones apart and feast on the seeds in the core. It is not necessary to see wildlife to know it is around. Early spring, before the crowds arrive, is a good time to explore the park. The forest and beaches are coming alive. Short hikes like the Bowman-Rosario provide good opportunities to ponder, look closely, listen and discover new things along the way. Though I have been here dozens of times, each visit reveals something I had never noticed before.